and on the sixth day, we try six word stories. She quit trying, then it happened. She woke up one morning. Found he was gone. 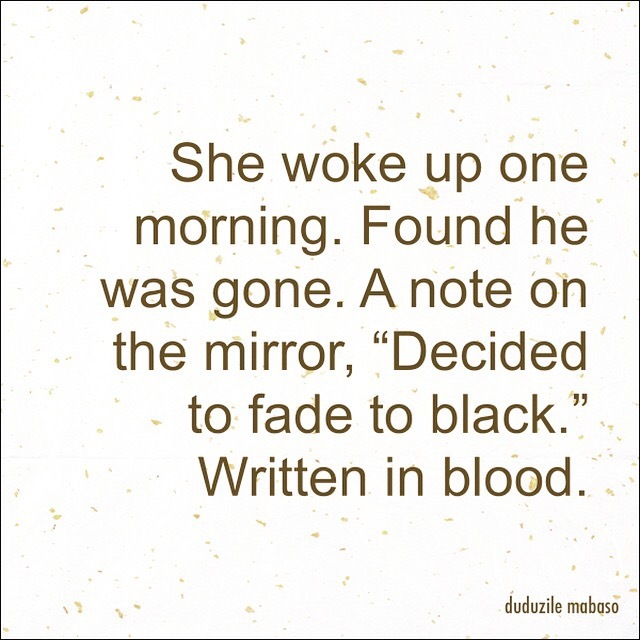 A note on the mirror, “Decided to fade to black.” Written in blood. and throw it out to the world. hidden between insecure and fear. because all flinching isn’t fleeing. a way into the hearts of many. you pay homage to those who came before. for even they knew fear but never flinched. your authentic self is capable of brilliance. with every triumph your true spirit shines. because actually i love and enjoy working.